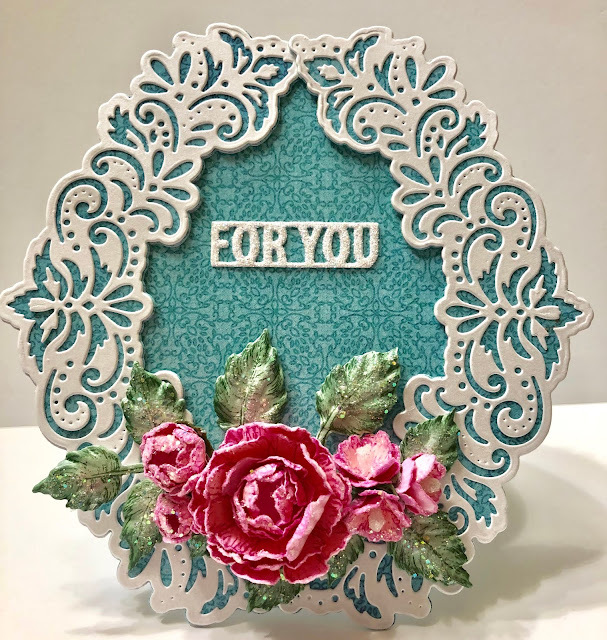 I created this beautiful card with one of the fabulous new dies. Instructions: Card is 6 x 6”. Cut Pearl White Metallic Cardstock 10 x 3 1/2”, score and fold on the long side at 5”, using the plain edge oval die from the Eyelet Oval Die, diecut the folded cardstock just above the fold to create an oval card base. 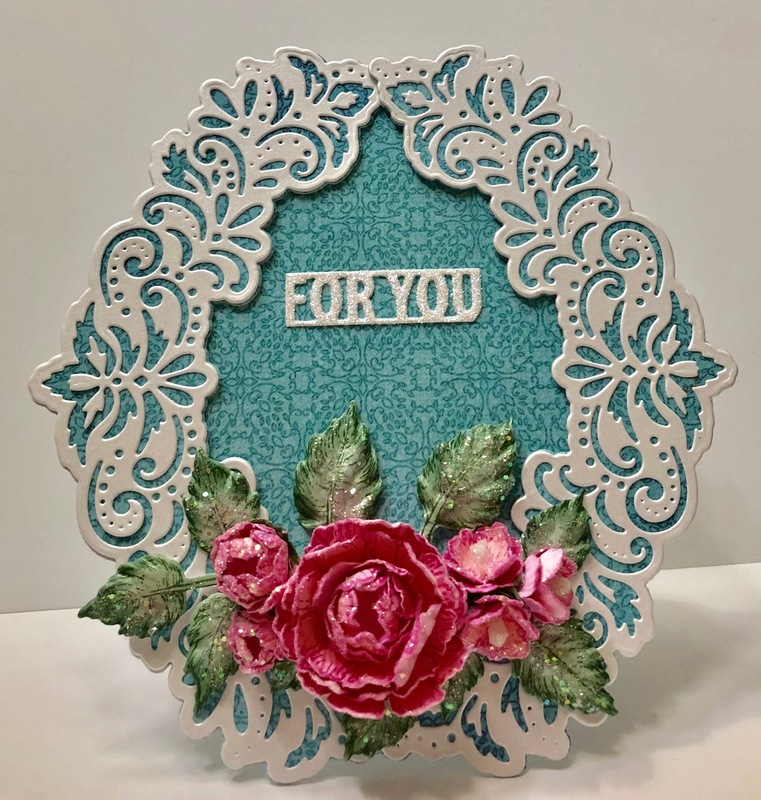 Using the same oval die, diecut a piece of paper from the Patchwork Daisy Paper Collection and adhere to the card front using dries clear adhesive. Diecut another piece of the same designer paper using the largest plain die from the Large Oval Die Set and adhere to the inside of the card. Using the Pearl White Metallic Cardstock, diecut the decorative die from the Ornamental Tags Die four times. Cut the same paper used on the card base four times using the outside die. Adhere these papers together back to back to have the same color on both sides. Adhere the decorative dies to both sides of the designer paper using dries clear adhesive. Adhere the two finished decorative dies together to form an oval. Adhere the decorative oval to the card base. 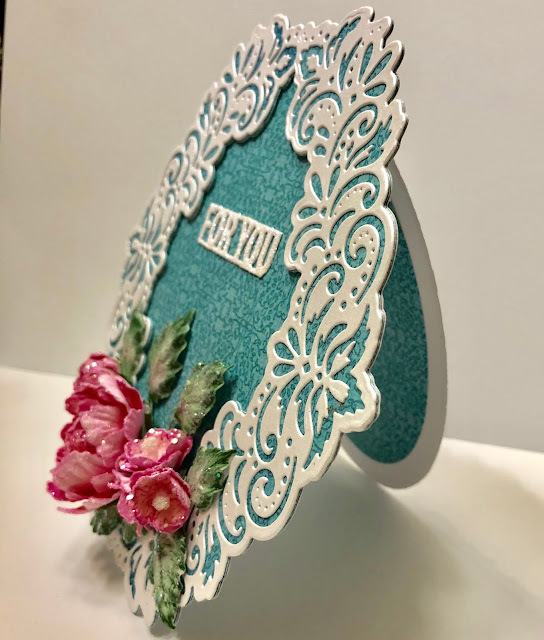 Diecut “A gift For You” tag from Pearl White Metallic card stock using the Ornamental Tags Die set, cut off “A Gift”, sponge with dries clear adhesive, sprinkle with Crystal Ultrafine transparent glitter and adhere to the card base as shown. Stamp Small Peonies on Floral Oriental White cardstock with Magenta Hue ink. Color with Rose Madder and Magenta Hue inks, diecut using the coordinating dies, shape using the 3D Floral Basics Shaping Tool and finish the shaping with the Deluxe Flower Shaping Kit. Assemble the petals to create one medium flower, two buds and three small flowers. Pierce the centers of the small flowers and add a stamen to each one. Sponge the flowers with dries clear adhesive and sprinkle with Rajni Chawla’s Crystal Clear. Stamp the leaves on Floral Oriental cardstock with Olive Archival ink, color with the Olive and Magenta Hue inks and diecut using the coordinating die. 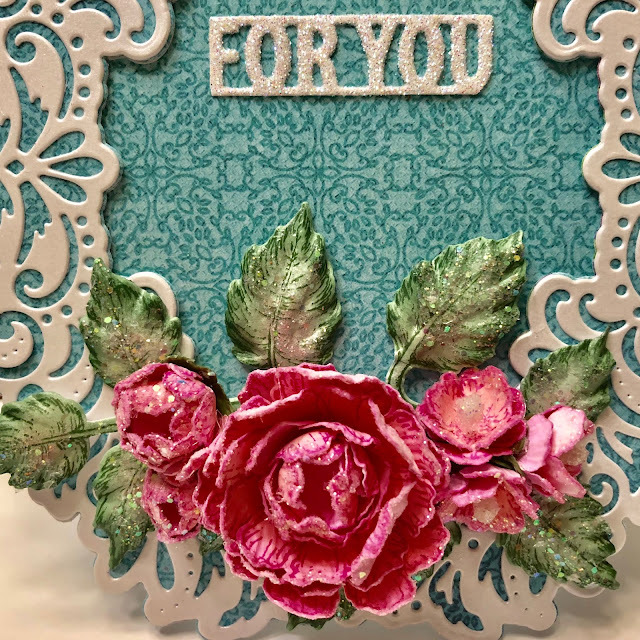 Place in the Leafy Accents Shaping Mold, spritz with water, run through the die cutting machine and finish shaping with the deluxe flower shaping kit. Sponge the leaves with dries clear adhesive and sprinkle with Crystal Clear Glitter. Adhere the flowers and leaves to the card base as shown using the hot glue gun. Be sure to stop by the Heartfelt Creations Blog to see all of the beautiful projects created by the oh so talented design team. This is soo beautiful Janet!!! I love the color and flowers you used! I actually did one too in pink, so funny, great minds! I love the shaped cards and this one is a beaut!